New York Rangers President and General Manager Glen Sather announced today that the club has agreed to terms with forward Chris Kreider. Kreider, 20, was selected by the Rangers in the first round, 19th overall, in the 2009 NHL Entry Draft. On Saturday, he captured his second NCAA Championship in three seasons with Boston College, registering three goals and an assist in four tournament contests. He notched both Boston College goals in a 2-0 victory against Air Force in their first round matchup on March 24, and tallied a goal and an assist in a 6-1 win over Minnesota in their National Semifinal game on Thursday. Kreider led all skaters with six shots in the National Championship game, a 4-1 win against Ferris State. The 6-3, 230-pounder established collegiate career highs in games played (44), goals (23), assists (22), points (45), and penalty minutes (66) this season. Kreider led Boston College in goals, points and shots (139), tied for first in penalty minutes and ranked fourth in assists. He helped the Eagles capture its third consecutive Beanpot and Hockey East Tournament titles. He registered one goal and one assist, along with 14 shots in two games at the Beanpot, while tallying four assists and 12 shots in four games during the Hockey East Tournament. Two-time NCAA champion Chris Kreider, the Rangers' 2009 first-round pick, will likely make his NHL debut in the playoffs, becoming the first Blueshirt to do that since Lauri Korpikoski in 2008. The Boxford, Massachusetts native skated in 114 games over three seasons with Boston College of Hockey East, registering 49 goals and 43 assists for 92 points, along with 129 penalty minutes and 364 shots. 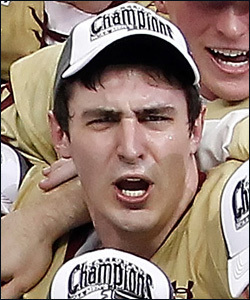 Kreider was named MVP of the 2011 Beanpot Tournament, tallying two goals and one assist in the title game en route to capturing his second Beanpot Championship with Boston College. In 2009-10, he became the first hockey player to win a World Junior Championship gold medal, Collegiate Conference Playoff Championship and NCAA Championship in a single season. Kreider helped the Eagles capture their fourth NCAA National Championship in 2010, recording a goal in the Championship Game against Wisconsin and finishing the tournament with two points (one goal, one assist). That season, he was named to the Hockey East All-Rookie Team, ranking second among conference Freshmen in goals (15) and tied for ninth in points (23). Internationally, Kreider has represented the United States in several tournaments, including at the 2010 and 2011 IIHF World Championship. He registered a goal and an assist, and posted a plus-three rating in six games at the 2010 World Championship. In 2011, he tied for second on Team USA in goals (two) and fifth in points (three) while skating in seven games at the World Championship. Kreider is also a two-time medalist with the United States Under-20 Team. He led Team USA and ranked third in the tournament with six goals, including a hat trick in a first round matchup against Latvia, en route to capturing the gold medal at the 2010 World Junior Championship. Kreider also led the United States and tied for fifth and first in the tournament, respectively, in goals (four) and power play goals (three), tied for first in points (six) and second in shots (20) while capturing a bronze medal at the 2011 World Junior Championship. Kreider entered the 2009 NHL Entry Draft rated 14th among all North American skaters in the Central Scouting final rankings, and as the highest ranked high school player, after ranking sixth among all high school players in point per game average (2.15). He led Andover-Phillips Academy (HS-MA) and established career highs in goals (33), assists (23) and points (56) in 26 games.